I do not have GPS in this setup but it should not matter for Altitude hold (I guess). Repeat (1) and (2) until it touches the ground. Can you please tell me what can be the cause of such behavior and what I missed here? I probably need ro reduce the D value. 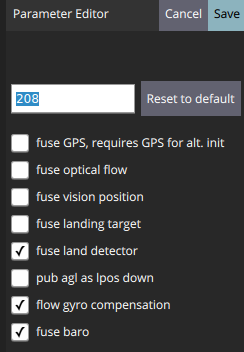 But if I unmarker barometer in LPE fusion (so just the lidar for the z measurement), in the widget Analyze, I cannot see Local NED X, Y and Z anymore! Is it meaning that LPE is not able to compute local NED without the baro?